Capital of the Nabataean Arabs, Petra is one of the most captivating archeological sites in the world. The ancient city dates back before the 1st century BC and remains a fascinating and beautiful place after thousands of years. A unique attraction where great cultural, natural, geological and archeological features merge, Petra was chosen by the Smithsonian Magazine as one of the "28 places you should visit before you die." 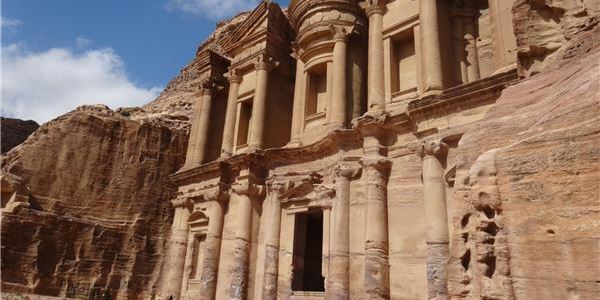 Explore Petra Archeological Park to discover one of the 7 Wonders of the World. A UNESCO World Heritage Site, Petra is a breathtaking landscape of pink-hued rock mountains and trails. Visit the museum and monumental Nabataean tombs carved in the southern cliffs. Open to visitors daily from 6 a.m. to 6 p.m. during the summer and 6 a.m. to 4 p.m. in the winter. How long will it take to explore Petra? This beautiful ancient city offers a breathtaking landscape of trails, mountains, altars and amazing archeological sites and you should plan on spending at least one full day. If you are visiting for one day, check out the Siq, Treasury, the royal tombs, Street of Facades and the museums. If you have another day, explore the archeological site and the shopping bazaars with silver jewelry and Arabic cloths. Wear comfortable shoes and bring a camera! Visitors can arrange guided tours at Petra's Visitor Center, which is open 6 a.m. to 6 p.m. during the summer and 6 a.m. to 4 p.m. in the winter. Tour guides speak Arabic, French, Spanish, English, Russian, Germany and Greek and offer a deeper perspective of this ancient city.